My physical therapist broke up with me on Friday. Actually. He was pretty gracious about it and let it seem like I was breaking up with him. But I think, deep down, we both knew what was really happening. They were giving him trouble about covering my visits even though it is a new year and they are responsible for covering at least 25 visits per year. And, really, what can a girl say to that other than. Okay. Then, to really drive his point home, I ran my first race this weekend. Four miles. At an 8:08 min/mile pace. I haven’t been that fast since…2009. Ecstatic. Is the only word I have to describe this. Ec.Stat.Ic. I would have jumped for joy except…I’m prohibited from jumping ever again for the rest of my life (stress fracture prevention rule numero uno according to Josh). So I ate pasta for joy. Same difference. I know you’re totally scratching your head being all like…she put fruit in her pasta sauce again!?!?!? Um, yes. Yes I did. But let me remind you that tomatoes are fruits also. So you are always putting fruit in your tomato sauce. Whether you realize it or not. The apples are grated into the sauce so their tart sweetness just kind of melts in with the tomato sauce flavor that we all know and love. But it’s the combination of them with the parmesan cheese that really gets you hooked. It’s almost like there’s a sweet/salty thing going on. But in a better-for-you-than-salted-caramel kinda way. PS – Thank you all for all of your support and sweet comments about my grandfather. My family and I really appreciate it and they mean so much to me. PPS – If you live in NYC and ever have any physical therapist needs, then please let me know! My physical therapist specializes in running/lower body injuries and, being an athlete himself (two time marathoner and triathlete), understands the psyche of a runner (which is no trivial thing). I’ve had a LOT of bad physical therapists in my life and know how life-and-leg altering a good one can be. Even though I can’t necessarily always SEE the results, my race this weekend proves that they’re there. I have to remember that it’s not about a number on a scale but about healthiness and fitness. It’s going to happen. I’ll get back to where I want to be. Step by step. Little by little. And here’s a funny link that my physical therapist actually posted on facebook. Top 10 Ways to Get Skinny Fat. I agree with all except the vegan diet thing. And weight watchers. But I think that’s because you can do weight watchers two ways – by eating all of your points in real healthy foods or by eating all of your points in hershey’s bars and McDonalds. I do the former and I think they’re talking about the latter. Pour the canned tomatoes into a food processor or blender and puree until smooth. Put the olive oil in a skillet and set it over medium heat. Add the onion to the pan. Cook and stir for about 5 minutes, until wilted and beginning to caramelize. Stir in the pureed tomatoes, season with the salt, and heat to a bubbling simmer. Cook, stirring occasionally, for 5 minutes or so. As the tomatoes perk, peel and core the apples and remove the seeds. Shred them, using the coarse holes of a grater (or using your food processor attachment). When the tomatoes have cooked about 5 minutes, stir the apples into the sauce. Heat again to a simmer and cook the sauce, uncovered, for about 15 minutes, stirring now and then, until it has reduced and thickened and the apple shreds are cooked and tender. Meanwhile, bring large pot of salted water to a rolling boil. Drop in the spaghetti. Cook until barely al dente. Lift the spaghetti from teh water, let drain for a moment, and drop it into the warm sauce. Toss pasta with sauce for a minute or two. 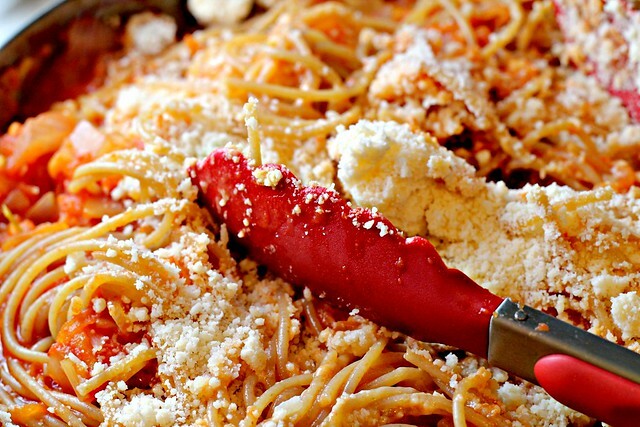 Turn off the heat, sprinkle the grated cheese over the pasta, and toss well. Heap pasta in warm bowls and serve immediately. 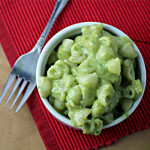 I am submitting this to Presto Pasta Nights, which is being hosted this week by Tandy of Lavender and Lime. 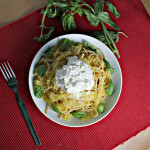 Spaghetti and Spaghetti Squash with Lemon Garlic Sauce and Ricotta…Eat.Live.Be. For a Better 2011! 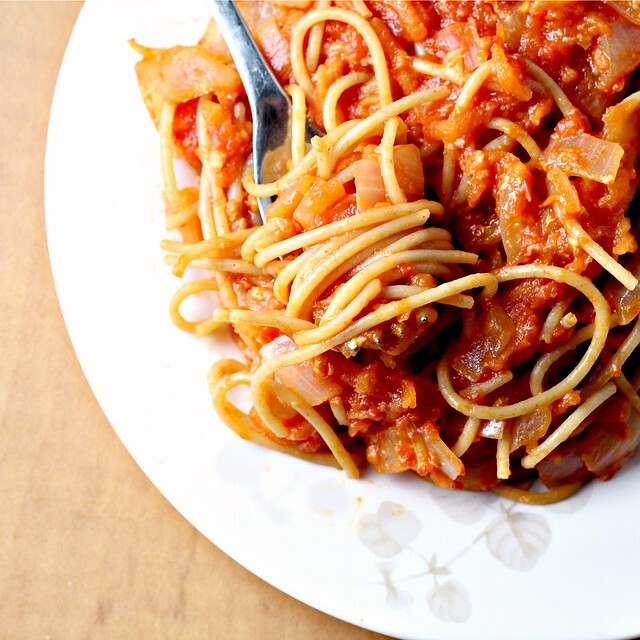 102 Responses to Spaghetti In Tomato-Apple Sauce…Eat.Live.Be. Tomatoes and apples are a combination I have never had (or really ever even considered). I’m intrigued! That tomato sauce sounds killer! Yum! Oh I can slurp that pasta for sure. Apple and tomato-it must be a perfect match! Apples dominate my life so I cannot wait to try them in spaghetti sauce. Yum. If anyone else told me to put apples in my tomato sauce I’d make a face, but if you say it is good I know it must be! A break-up you can feel good about! I’m actually trying out a pasta dish tonight that calls for apples and apple juice, so there you go. It sounded strange, but comes from a trusted source. I believe you both. And if it’s bad, I have a tiny bit of cookie dough dip left to wash it down with. I’m a little behind and missed the post about your grandfather. I am so sorry to hear about your loss. My thoughts and prayers are with you and your family. I have to say that your EAT.LIVE.BE. post touched home with me… I have to remember that I won’t be able to visibly see things just yet, but remember that I’m improving my healthy and fitness in other ways that I can feel rather than see. And AWESOME job on that race! One day, I hope to get to a 10 min mile… still working on that though. Uggggh, effing insurance and phys therapy. Seriously. That chunky sauce looks heavenly, I’m so curious about the apple flavor. Ugh, insurance and phys therapy. Love the chunks in the sauce. Want some now. 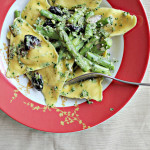 This pasta dish looks delightful! And CONGRATS on your awesome race! Well done. 🙂 I know how good it can feel to have a confidence boost from a great race after being delayed by injuries!! From all this I concluded that insurance companies are the same everywhere! So, as long as you make such beautiful dishes, forget about them and just concentrate on what really matters here, this pasta! I have never heard of apples in my tomato sauce. How intriguing. So exited for you regarding your run. That’s awesome!!! Btw…this is the only blog I read without ANY skimming. I love your writing. Every post and I truthfully don’t know how you do it. OMG! I love apples in everything, but tomato sauce? Hmm, I think I would love it! I wonder what my family would think? Ehh, who cares, this I must try! Great job on your race! That’s gotta feel good. And I gotta say that this pasta celebration looks like it more than makes up for the lack of jumping in your life. Interesting – i am definitely curious about the flavors sounds great! So, what you’re saying is there’s more than one way to eat an apple 🙂 I’m going to do this in my next batch of sauce. Congrats on your race! Nicely done my friend. I have never thought to add apples to tomato sauce but it totally makes sense. YUM! I think the grated apple sounds like a lovely way of balancing out the natural acidity in tomatoes. I usually add a tsp of honey so why not apples! I’ll give it a whirl. Really sorry to hear about the break up, esp just before Valentines. I suppose it wasn’t meant to be. Congrats to you on your running time… That’s seriously amazing! 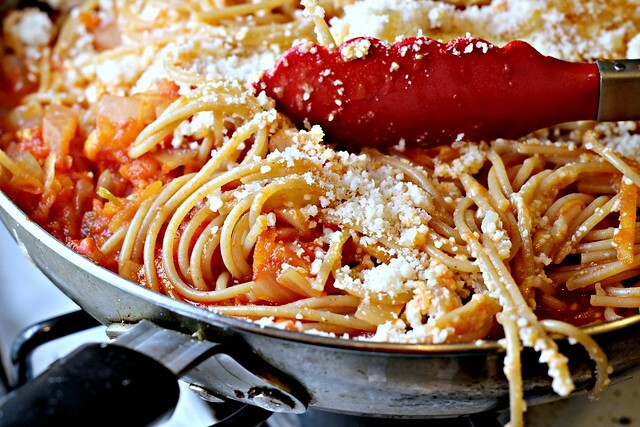 The pasta looks like the perfect way to celebrate your awesomeness! Aw, your physical therapist sounds like a catch. Without your description, I’m not sure I would have tried this. But now I have to. I really like the idea of naturally sweetening a sauce with apple, and good point about the fruit thing. 🙂 Sorry about your physical therapist. Here’s to hoping you won’t be needing him again any time soon! Congratulations on your fast run-that’s impressive!! YOU are impressive. Well done. I was a little weirded out at first, but if the apples are grated not in chunks, I can definitely handle this. And I have no doubt the flavor is amazing. These pics made me drool!!! LOOKS SO YUMMY! this sounds yum. I would have never thought to add apples to the sauce. Yay, congrats- that’s so awesome! I never had any doubt. And I love the thought of eating pasta for joy =) This sounds wonderful and yeah, when you stop to think about it, it’s not really that “odd” of a combination. I like it. Wow Joanne! Congrats! Your so fast! :). Apples in pasta sounds supppperr good to me! I LOVE this idea! Definitely going to give it a try, but I will probably have to keep the part about the apples a secret until after my husband and tried and decided he likes it. Otherwise he will turn up his nose. Tomato-apple sauce? brilliant… love this and, I think I really needed to hear that quote about changes on the inside ;-). I am so EXCITED for you!!! Congratulations!!! Congrats on your race! Apples in spaghetti sauce sounds kind of exotic! I can’t wait to try it! The pop of sweet with the savory is right up my alley. 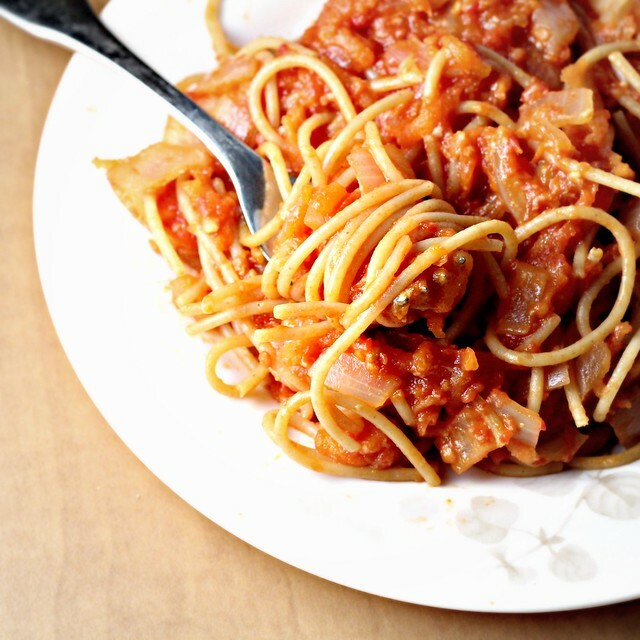 I never would’ve though of adding apples to spaghetti sauce but you make it sound so appealing! As for your race, congrats woman!! Congrats on a great race, my dear! Nifty article… what’s up with the scented products?! Tomatoes and apple sauce? What an interesting combination! I can’t believe there is a pound of apples in that. Yum! Oh I love this pasta!!!! Congrats on your run dear…. I am so sorry to hear about ur grandfather, I am so sorry to hear about your and your family loss. 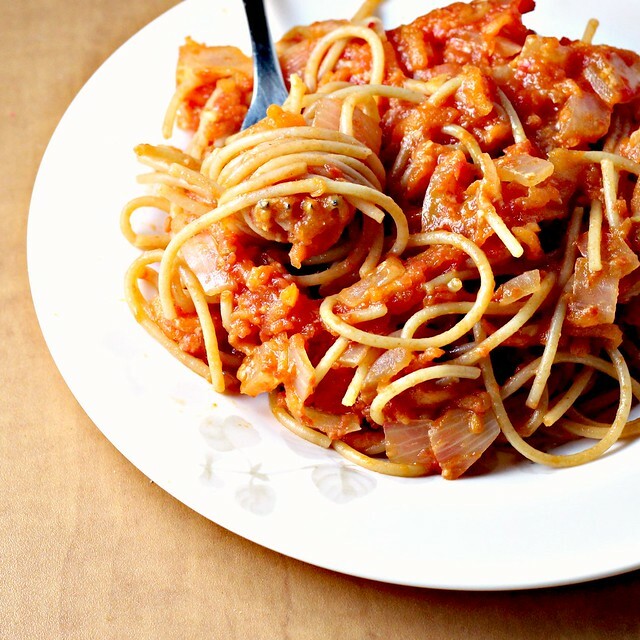 Wow..never tried apple sauce in spaghetti before, this looks so yum! Wow! Congratulations on your great run time 🙂 I love to walk, but avoid running like the plague, so I appreciate anyone who actually enjoys it! Great addition to your pasta sauce, too. I always add a little sugar to mine for some sweetness, but I love this idea! tomato sauce with apples sounds interesting. I have to give your recipe a try, I never thought of combining this 2 ingredients. Love the idea of tomato and apple! Can’t wait to try it! Your sauce sounds very interesting! I love the idea of the sweet and salty…it certainly looks delicious! So sorry about your grandfather. So glad to hear you’re back running at full speed and then some. Love all these gorgeous photos of your “fruity” pasta. Congrats on the great run, that’s fantastic! I’d love the sweet salty thing going on in the sauce. I’d like it right now if I could, it looks delicious. But glad the apple is grated and just adds flavor, not sure about a chunky apple tomato sauce for me. Apple? In tomato sauce? Kind of amazing … I have to try that. I am no stranger from using fruit in all sorts of dishes that it wouldn’t usually be found. Love the complexity it brings. Sorry (congrats?) about your breakup! Joanne, I think it’s amazing combination! Trust me, here in Dalmatia is all about Mediterrean food, ecpecially Italian, so I know what are you talking about! What an ingenious idea!! Sometimes I bolster tomato sauce with greens but never thought about adding apples. LOVE IT! Great post – as usual, love your writing and have mixed feelings about the breakup… always sad to take a break from someone special… but great news about getting stronger and congrats on the race. And thanks for another delicious pasta for Presto Pasta Nights. Tomato-Apple Sauce? Sounds very exotic and delicious! i just know that the next physical therapist you get will be much better 🙂 still a bummer though. however, CONGRATS on the run, that had to feel amazing. i seriously feel rejuved and inspired every time i visit your blog. it really is about the small changes. and i completely agree about the WW thing. i was never as successful on the program when i was just getting my points. i had to actively monitor the types of food i was eating to lose the weight. LOVE the pasta dish. i am so intrigued with the apples in there, delicious! Thanks for keeping us entertained with your life and your food. I admit, I am having a hard time with the applesauce and the tomatoes and yes, I know they are both fruit. Congratulations on your run and condolences on your break up with your PT! I would have never though to add apples to pasta sauce but I get it. The added sweetness must taste delicious. We must be on the same wave length. I just made Stephanie Izard’s pasta ragu that has apples in it! Too funny. I must say, I am digging the addition of fruit in pasta sauce. It sounded a little strange at first, but one taste convinced me it’s genius. Oh this just looks so delicious and has really made me hungry!! as if your therapist knows that you’ll be back. i kind of like his humor you know? at least he’s not boring. and you promise me that the apple sauce will not make the spazzghetti soggy? I am so sorry to hear about your grandfather. I missed that post initially. I’m glad that you’ve been surrounded by loved ones and friends who care about you. My memories of my own grandfathers are some of my most treasured ones. Your physical therapist? He completely cracks me up. Love his humor. And your writing about it all. Enjoy the breakup for as long as it lasts. Congrats on that marathon time!!! You are AMAZING! Way to go! And last but NOT least, holy smokes, apples and tomatoes? I wouldn’t have gone there, uhm, ever. Now that you’ve described it though, I just put it on my list to try. Yes, I did. Have an awesome night and thanks for the recipe! I’ve never thought in a million years (ok, maybe not that long) that apples would taste great with pasta. But, I think I’ll give this one a try. My husband actually loves to put some applesauce in his spaghetti Bolognaise. I am going to try make the tomato sauce with apple next time. Thanks, Joanne, for sharing it. Congrats on the race!!! Glad you’re on the mend. 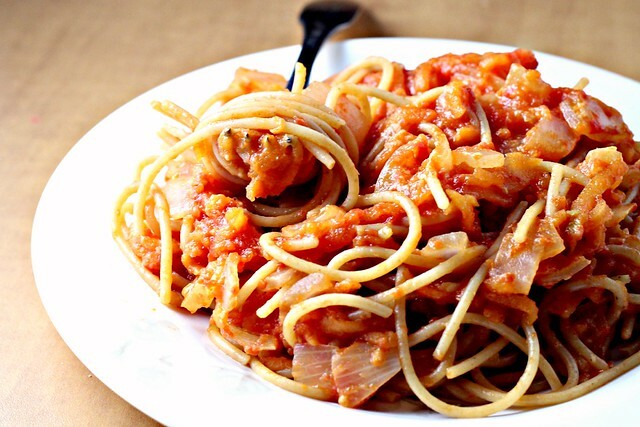 The spaghetti looks delicious, love the flavors. Bookmarking to give it a try. I’m glad you’re doing so much better! Let me tell you, pylometrics pulled more tendons than running ever did! Screw squat and tuck jumps! An interesting and beautiful sauce for sure. Congrats on your race time! What a great accomplishment! Apple and tomato, that’s not the first flavor pairing that comes to mind for me but hell, the BBQ freaks are putting apple, peaches, and such in bbq beans. I can see how it would work, very adventurous! The apples in the sauce sound so interesting, I’d love to try this! And congrats on your super fast race!! WOW, I’ve never seen anyone else use apples in their pasta sauce. My Mom makes one that she learned in cooking class as a young girl in New Zealand. She also adds a bit of sugar and red vinegar and we always put a nice cheddar on it as well. Mmm… sounds so yummy right now! Fabulous recipe! My husband and I really liked it. 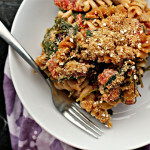 I’m featuring this recipe on my blog today as part of the Crazy Cooking Challenge!